Streetsblog: Left in the legislative session? JSK: Yeah, well, maybe four days left, maybe more days. August in Albany. What can be better? SB: (Laughing) So, let’s start with something other than congestion pricing. How was your trip to Copenhagen to meet with Jan Gehl? Had you ever been before? SB: What did you think? JSK: I thought it was spectacular. The experience of riding a bicycle in a city in which the car is not the priority was really inspiring. One piece that was a bit of a surprise was how well behaved people were in Copenhagen. I didn’t see a single person break a single traffic law while I was there which is certainly a little different than the experience that we have here. SB: I noticed the same thing when I was there last fall but every Copenhagener I asked insisted they were just as rude and unruly as New Yorkers. JSK: Gehl went through the historic trajectory of how they’ve reclaimed public space bit by bit, one street at a time. Today, they’ve reached a tipping point where 36 percent of the people commuting to work are on bike and they’re looking to get that mode share up to 40 percent. 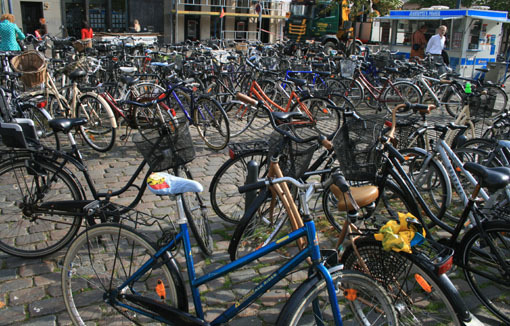 The other thing that amazed me is that there are all of these bikes parked all over the place and it appears that none of them are locked. They all have these small black handcuffs on the rear wheel. You turn the key and this steel rod comes through and locks it up. How long do you think that would last on the streets of New York City? Ten minutes? So, there are definite cultural elements that make Copenhagen Copenhagen and need to be adapted to work in New York. But the design of the streets and their approach to the streets are really interesting and I’m hoping to bring Gehl over at the end of next month to help us work on a pedestrian and public space strategy much like what he did for London. SB: Would you have him work in a specific location or citywide? JSK: We need to be able to show what can be done in all five boroughs with a variety of different techniques. But not everything needs to be a massive capital project. I’m looking to see what we can do on a shorter term basis to have some immediate impact in reclaiming streets and coming up with different designs for roadways and sidewalks. SB: Are you looking at reclaiming on-street parking space for other uses? JSK: That is something we’re looking at. In fact, we’re talking about removing a lane of parking on Broadway next to City Hall. Deputy Commissioner Michael Primeggia has been really great about looking for ways to reclaim street space. He’s been helping me identify where these different places can be. The other question is once we reclaim it what do we do with it? You have to do it in a way that leaves a meaningful public space. SB: So, let’s talk about congestion pricing. There are a lot of negative signals coming out of Albany and Sheldon Silver. What’s the status? JSK: We’re very hopeful. It’s a heavy lift, certainly. The Mayor’s working very hard and all of us are working very hard to see the legislation and authorization come through by Thursday, which is when the session ends. The Senate has been terrific. Bruno’s been really good. The Assembly is open and we continue to do briefings. The governor has been very supportive, so that’s a big help. We’ll see what happens when the chips fall on Thursday. SB: If congestion pricing doesn’t pass do you have a Plan B? Are there traffic reduction measures that the city can implement if this plan falls through? JSK: Everyone is shooting for Thursday but the promise of a special legislative session later this summer is still out there. So, Plan B is the special session. We are not giving up hope at all. We are fully committed. We need to get this legislation passed. It needs to pass now. It would be ridiculous to throw away hundreds of millions of dollars in federal funds. That’s our plan and when the plan passes we’re looking to institute a series of immediate short term improvements before the switch is flipped on congestion pricing, including increased express bus service, ferry service and a variety of other initiatives. So, our emphasis is on making sure this congestion pricing program passes. On the transportation side, we don’t think there’s anything more important for the future of New York than getting this plan through. SB: Is it a given at this point that no new “SMART” authority will be created and the MTA will administer the congestion pricing program? JSK: That is still in negotiation. On the governance side I think that they are looking at a model that includes both the city and the state much along the lines of the Capital Program Review Board which handles the MTA’s money. There are four votes on the CPRB: the City, the State, the Assembly and the Senate. Four people in a room. It takes a unanimous vote of the CPRB to pass the MTA’s capital program. So, I think people are moving towards that kind of a governance model. But the negotiations continue. SB: The City’s proposed Bus Rapid Transit system will be dependent on camera-based enforcement of the bus lanes. Is the legislature going to give us the cameras? Is that sort of issue even on the radar in Albany right now? JSK: It’s definitely on the radar. It’s part of our plan. We’re hoping it is also addressed in the next four days. Keep those phone calls going to your legislators. transit without any apparent downside. SB: Towards the end of his private consulting career, your new Deputy Commissioner Bruce Schaller put forward a study suggesting that pedestrianizing Prince Street in SoHo, say, on weekends, might be doable and even desirable. Can we expect to see you move on this type of project? JSK: We’re looking at all sorts of treatments to improve the streets of New York. Bruce being here is going to help us. A lot of people have interesting ideas. It will be exciting to have Jan Gehl here because he will help us identify some of the places where we can do urban acupuncture and specific interventions, much as he’s done in other cities. As important as it is to do these interventions, it is also important to ensure that we have policies and programs in place that will set the direction for the agency for years to come. Where does she stand on one-way pairs? Reclaiming streets? Eliminating parking lanes? Inspired by a city that prioritizes the bicycle above the car? Can anyone even IMAGINE Weinshall having these ideas? Let’s salute Sadik-Khan and the bright, green future. We are seeing how change begins and trickles from the top, a situation absent in DOT for some time. The developments so far are positive, and it is equally exciting to see the results. It’s refreshing to see decision(place)makers like JSK and AB to make time to learn from examples worldwide and apply them in a way that is unique to NYC. It is also imperative to remain open minded and take small risks. But they should not go about it alone and should involve community members every step of the way as they can enhance proposals in meaningful ways. The only way to deal with naysayers is open communication and providing grounds for tests that can provide measurable results. How about doing something not so flashy like making it easier to walk down the sidewalk? Get rid of the blockages of newspaper boxes in front of every subway entrance and the illegal vendors, and permanent scaffolding and sidewalk displays and… you name it… that makes walking such a chore in so many places. It doesn’t take a Danish design genius to figure out that there is something seriously wrong with how pedestrians are treated here. Does anyone care about regular, everyday pedestrians trying to make their way or is it all about the half percent of people who ride their bikes to work? After 16 years of living in this city, I still can’t believe we are talking about these ideas. This is so wonderful. Yes, yes, yes, people (including those who read this site) care about pedestrians! It’s just that a lot of the grassroots of this movement was probably first organized by cyclists, so a lot of the core organizations in the movement have cycling high in their awareness. But all of the major players I’m aware of, all definitely work for better conditions for pedestrians. In fact, it was a study done by no less a cycling-friendly organization than T.A. that made me first realize that pedestrians don’t just deserve “better conditions,” they arguably deserve primacy of public space, since as a segment, they are the biggest contributors to the City’s economy. And finally, conflict between pedestrians and cyclists can be ugly and very ire-inspiring, but it’s ill-begotten and shouldn’t exist: those two groups have been left to fight over the scraps of publicly-owned space left by motorists, the far more destructive hogs of public space. This movement also seeks to correct that problem by unifying the two would-be (and should-be) allied communities. ddartley – I couldn’t agree more. Ped/bike conflict often stems from cyclists using pedestrian space because the street is just too dangerous. It would be great to bike to work but everyone is right here, in the present it’s just too dangerous to ride on the streets. To echo Momos’ point, the main thing that would make it easier to walk down the sidewalk isn’t abridging free speech, it’s making the sidewalks wider. If Salud is interested in what Streetsblog has to say about pedestrian safety, here is a list of posts in that category. One in particular is this post about sidewalk conditions in Midtown. Yes, it is dangerous on many streets, but many cycling routes on the DOT map are acceptable and are chosen as such because they are less dangerous. Even in Manhattan you can find streets that are okay to ride on: Hudson Street, Lafayette, 8th Avenue in spots, crosstown bike lanes, etc. If you can find enough streets like that, utilize the Hudson greenway, and streets with wide, buffered bike lanes it is worth an attempt to ride. The more of us, the more ammenities, the more mass, the more comfortable we’ll get. But we need to do more always to encourage those who might consider it but still think it is too scary. Yes to wider sidewalks, Angus and Salud. Just one of many benefits: wider sidewalks would counteract the side effect I worry that congestion pricing might bring: I fear that the pricing will result in motorists having wider open street space–and that, coupled with the same old bloody speeding-inspiring traffic lights, will cause even more illegal and dangerous speeding. I often bring up the idea of reducing the speed limits on the books, but significantly widening sidewalks might actually be easier, politics and all else considered. Agreed, Angus and ddartley; wider sidewalks are a necessity. I can’t even say how many times I’ve been stymied by high foot traffic on narrow sidewalks. Once the congestion pricing is in, it’s time to reclaim some of these car lanes on wide streets for more pedestrian space. Closing some sidestreets to car traffic would be a tremendous boon as well. The IRUM plan for a car-free 42nd street would be a beautiful thing . . . but closing off Prince Street, or even Spring Street, as examples, on weekends would be incredible. Especially from April to October. I’m so happy for the right thinking people on this blog who now have people in leadership positions that they trust know the right thing to do. I’ll save my comments until it all disintigrates politically in the coming days and we all stomp our feet and wonder why. Looks like the city will be truly reformed before our eyes. I’m not quite as skeptical as Nic, but I am starting to become concerned by the lack of specific commitments from the new DOT. I suppose they may feel that any measure that can be spun as anti-motorist must be avoided while CP is up in the air, but CP is going to be up in the air for months, perhaps years. When does DOT start taking the steps it can take, without Albany or the City Council, to realize the transportation goals of PlaNYC? Steve – I also believe we need to look for specifics from the new DOT. However, keep in mind that the congestion pricing proposal is consuming all of their resources at the moment. This is a critical period — this week, especially (though the fight will probably go on until July 16). After July 16, when congestion pricing will either happen or will be dead, is when we can legitimately turn to the DOT and demand concrete evidence of the agency’s new direction. I can’t believe those copycats at the Cityroom! Should we be boycotting this, Aaron?